We all know the old adage about kids ignoring their presents just to play with the box they came in. Now the box they came in IS the present! 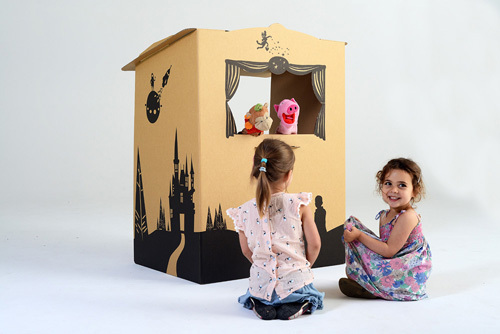 These super cool boxes are from brand new Tinyfolk, the brainchild of theatrical set designer Genevieve Dugard. 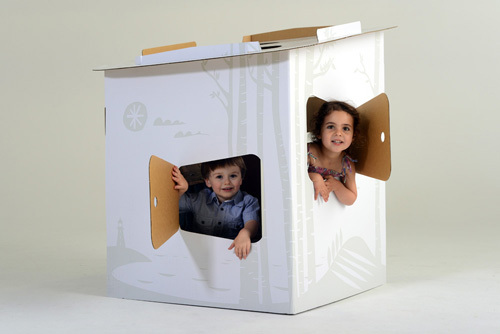 The Tinyfolk range currently includes cardboard playhouses, with doors, windows and plenty of space for dragging half your belongings inside; a cardboard puppet theatre (above) and a set of cardboard shadow puppets. The puppet theatre includes a shadow screen so it can be used as a shadow puppet theatre as well as a standard set. It’s all designed to encourage kids to explore their own creativity and unleash opportunities for imaginative play, and of course, it can be recycled eventually when they’ve outgrown it. The basically blank play canvas extends to the walls of the playhouses, and children can decorate for themselves. All the products come flat packed, and for the rest of February Tinyfolk is offering free shipping. Shadow puppet sets are $25, with playhouses beginning at $59 and puppet theatres just $79. Check out the range and buy online directly from Tinyfolk.